The Dark Lord with TWO HEADS!!!!! Of course, the problem isn't that there are two of them, the problem is that they're so rubbish. So, which is the least crappy Dark Lord Head? 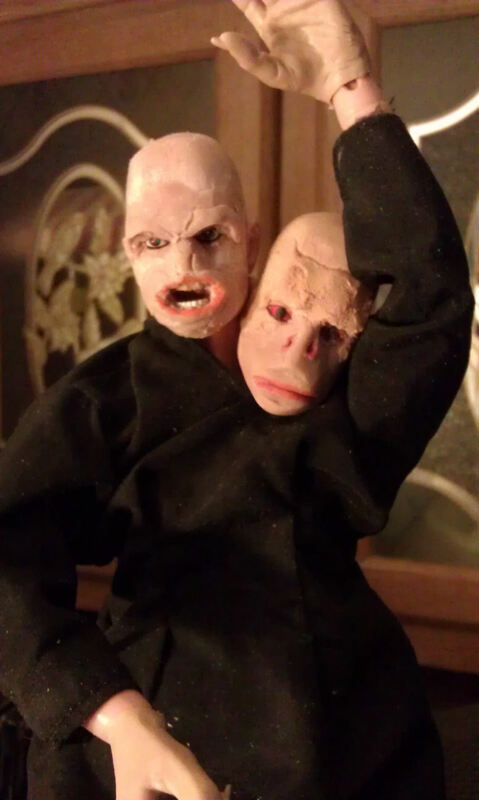 That one will live on Voldemort until I find someone who's made a custom Voldie sculpt. If you know someone who has, or who you think could and would, let me know! Ah, but which is the amazing electronic animatronic head that would be able to act rings arounf Mark Wing-Davey, except that nobody bothered to make sure the radio frequencies it's controlled by wouldn't conflict with the studio electronics, so it it sits there looking a lot like a dead, useless piece of plastic? At least it's not a second face in his neck despite us living in a world where CGI could actually achieve a two headed man effect! I try to be charitable, and say, "They just wanted to do something different to stymie people's expectations." On the other hand, OH EM GEE, that movie was, as they say, TEH SUKC!!!!!!!!!!!11!!!11!!!ELEVENTYLEVEN! Bill Nighy was great. (Which is sort of like saying "Water was wet.") And I loved the opening credits. I can sort of nod in appreciation of the Vogsphere scenes. What a waste of time, money, talent and film stock. The red-eyed head can go. The other one just needs less bone structure around the eye sockets. Tonner has a 17" Voldemort dollie. So, that's one vote for Open-Mouthed Voldie. I've seen the Tonner, but that's way too much money for way too big a head! I got him on sale off eBay for like sixty bucks. The Barbies confiscated his cloak, and he doesn't have shoes, so most of the time he just shambles around begging for spare change. I'm the Dark Lord! Gimme a quarter! I'm w/the Sgt. The red-eyed one looks (forgive me) a little chimpy. No need to cry for forgiveness: I'm in full agreement that both these heads are pretty bad, and specifically about the simian appearance of the closed-mouthed, red-eyed version. That's why I tried again! 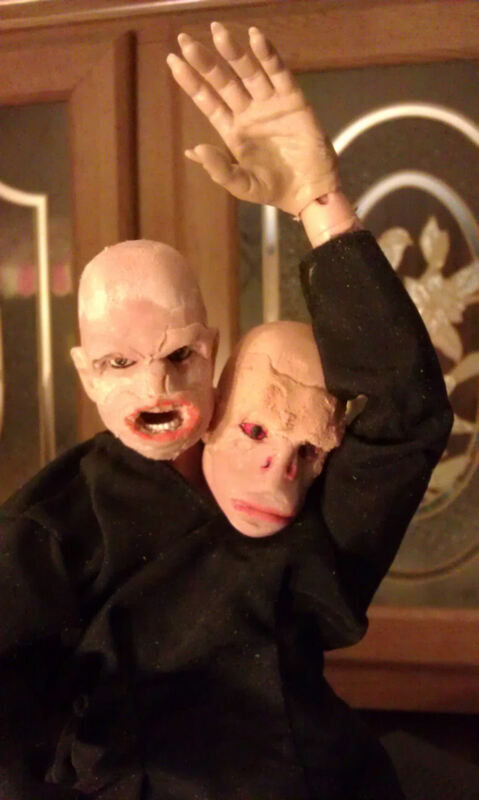 So far the votes -- all posted here, non on the action figure message boards or mailing lists where I've asked teh same question -- are unanimous, so it looks like Open-Mouthed Voldie will be it for the foreseeable future. Oh, and, I forgot to say, YES! I totally had Ray Milland and Rosie Grier's "The Thing With Two Heads" in mind! "Is there anything else you have two of?" --Bellatrix Lestrange unconsciously echoing a 1970s Muggle movie.